When you work with a digital marketing agency, it’s often a massive leap of faith. Whether your retainer is five hours a month or 50, you’re essentially handing over a bit of control to somebody else. This is why it’s so disappointing when things don’t work out, and you’re left with the task of looking for another agency while dealing with the mess the previous agency left. It’s like anything in life: you need to look out for the red flags. 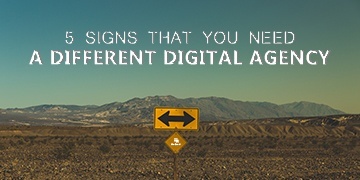 With that in mind, here are the top five signs you need a different digital agency. Your feedback serves as a powerful tool with which your agency can improve its service. In fact, statistics show that 70% of companies that deliver best-in-class customer service use customer feedback. There is always room for improvement. Whether it’s client communication, the quality of work and the meeting of deadlines, or the execution of your marketing strategy: if any area is found lacking, a disinterest in feedback means that said area will only get worse. If this rings a bell, it’s time to look elsewhere. You don’t need us to tell you that digital marketing is fast-paced. A resounding death knell comes to any agency that refuses to move with the times. In digital marketing, you need a fresh, forward-thinking outfit if you want to stand apart from the rest. If you’re feeling even the tiniest bit uninspired when your agency sends you work, then you’ll know that you’re with the wrong guys for the job. In an industry where there is always some update moving the goalposts, or something that bucks the trend, agencies need to be proactive and help you take advantage. Don’t go with a stick-in-the-mud agency, or you’ll get stuck too! This is connected to the last point. If your agency is reactive, instead of proactive, then your business is in the wrong hands. If it feels like your agency are often just too late to respond to things, or could’ve done more in the first place, then you may have to start looking elsewhere. Of course, there’s a line. Agencies deal with multiple clients every day, and it’s often easier said than done. If your agency seems to have gone quiet, it is likely to be because they’re creating some great pieces of content for you and are brainstorming the best ways your business can grow. However, it may also be a sign that you, perhaps, are not a priority. If you’re feeling a little neglected and like you’re being left in the dark, it is probably time to look for an agency that keep you in the picture on a more regular basis. Think about finances, too. If you don’t really know what your agency is up to, you won’t know where your money is going. Secondary to the point above, if the information from your agency comes in dribs and drabs, or things just aren’t explained well enough, you might be better off looking elsewhere. Even worse is the withholding of information: when you’re spending a good amount of money each month, it’s vital that you can trust your agency. Communication is key, and it’s better to know now rather than find out the hard way. If the above tips apply to your situation, download our How to Choose A Digital Agency guide. It’s packed with tips and expert insights to help you find your perfect agency. There you have it. If you have even the slightest inkling that the above applies to you and your business, give us a call. You can reach us on 0161 848 4300, or alternatively fill in an enquiry form here. Why not book in a call with our Director Kleon? He’s more than happy to talk over your options.